Having oily skin + acne means weekly deep cleansing for my makeup brushes. 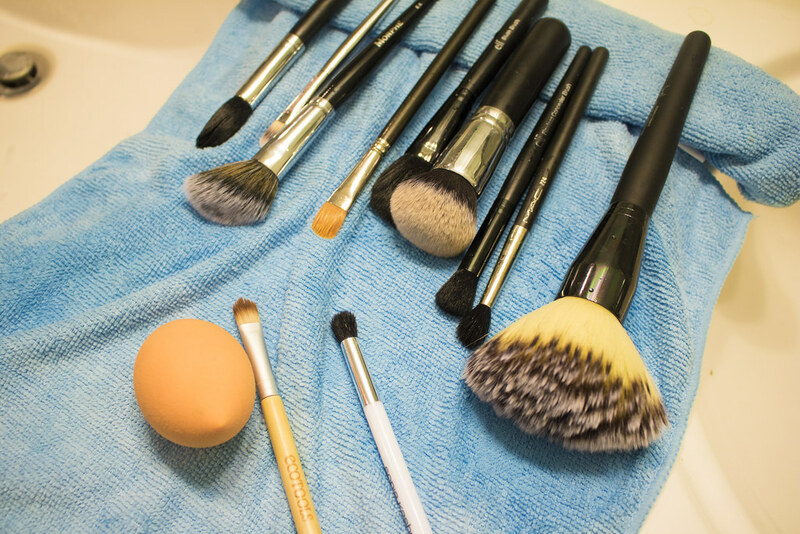 Even if you aren’t prone to breakouts it’s still a good idea to clean your makeup brushes because it’ll help them last longer. Plus who doesn’t like the feeling of freshly cleaned brushes? If you need more convincing check out this article from The Gloss on 10 Terrifying Things Dirty Makeup Brushes Do to Your Face. ? Seriously, clean your brushes, y0! I have two ways you can clean your brushes, both high and low budget options. I’ve tried a lot of brush shampoos, and the one by beautyblender is by far my favorite. Not only does it smell AMAZING but it does a fantastic job at cleaning. Originally I had my eye on the Sigma Spa Brush Cleaning Mat, but it was one of those things that was online only and never got around to buying. 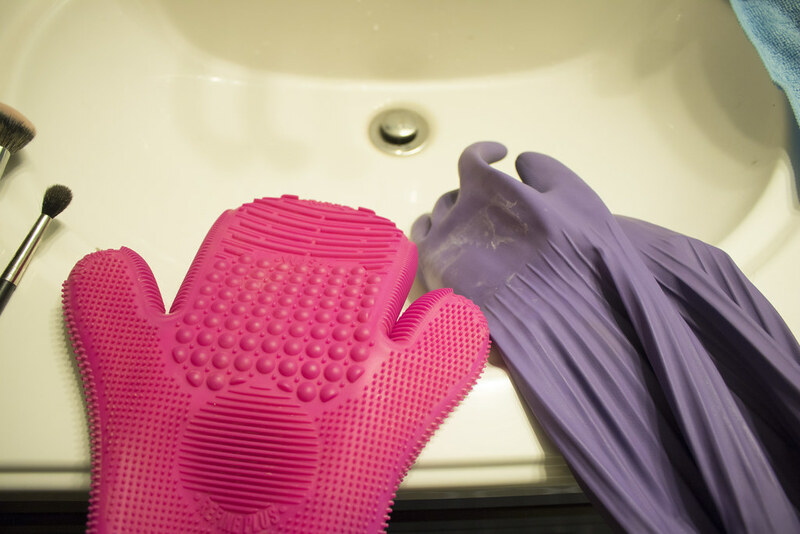 I stumbled upon the cleaning glove by accident when I was shopping at Nordstrom one day, so I jumped at the opportunity to purchase it in store. I love that it has a side for your eye brushes and the other side for your face brushes. It also is divided up into zones for washing and rinsing with different textures based on the kind of brush you have. I found out about using Zote Soap to clean my brushes through Amy Macedo’s video on how she cleans her brushes. You can pick up the soap at Walmart in the laundry section, at Home Depot, or if you’re not in the US you can get it from Amazon.com. 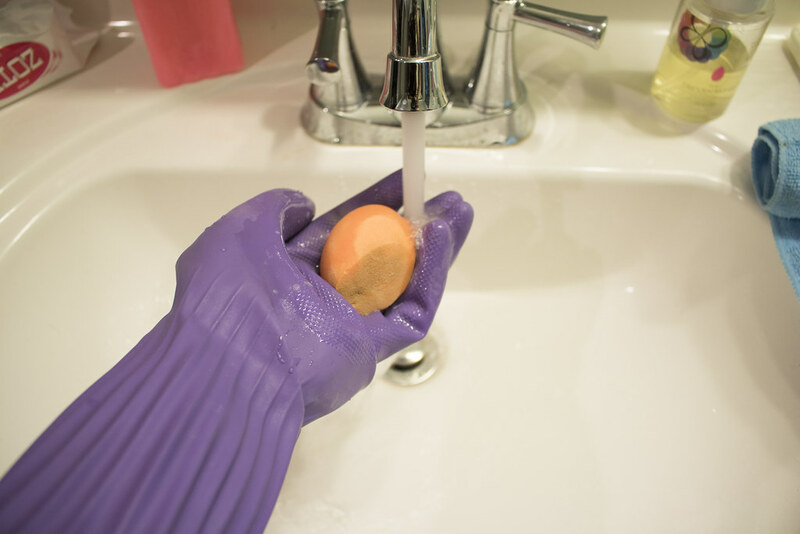 You can use dishwashing gloves if you don’t want your hands to get all soapy; plus some of them come with a little texture on them which is great for helping get that extra deep clean. If you want to use gloves, I’d recommend getting them at Dollar Tree or someplace similar; no need to spend more than a dollar on those! Baby Shampoo – This seems to be the most popular on the Internet because it’s gentle, but I’ve heard mixed reviews about whether or not it disinfects properly. 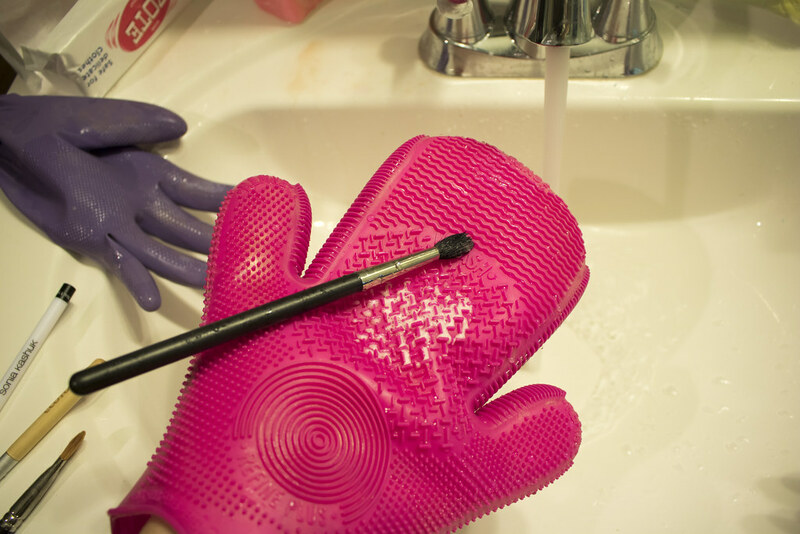 Dish soap – I personally don’t like the idea of using dish soap on my brushes because I worry about it drying out the bristles. Some people like it but not me. Face cleanser – I’d recommend a gentle cleanser if you go this route. Watch for anything that has active ingredients as it may damage the bristles. 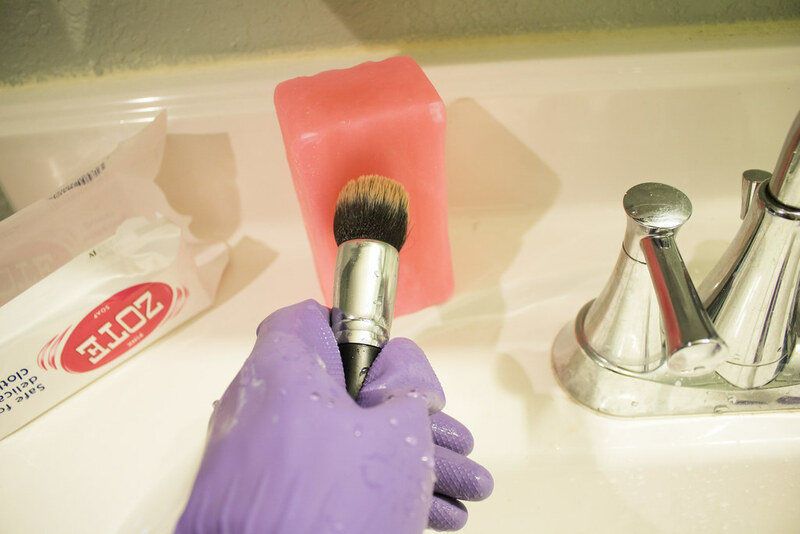 There’s a lot of different household remedies/DIY things you can use to clean your brushes, but I’ve found using the Zote Soap is the cheapest and quickest way to get your brushes thoroughly clean. That plus I like having a dedicated soap just for cleaning my brushes vs doing double duty with my dish soup. Out of the two options you might be wondering which one I do? It’s a combination of both, actually. At least for the moment. 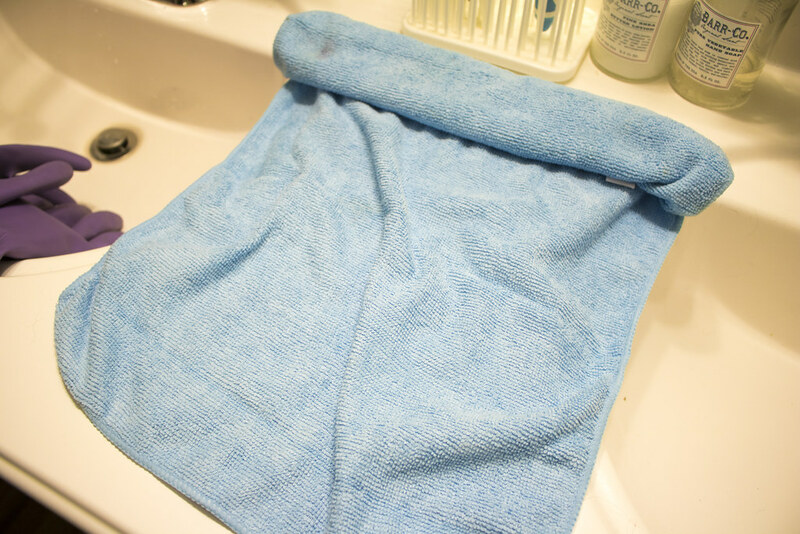 I take out my soaps, gloves, and set up my microfiber cloths for drying. I also assemble the brushes I will be washing; I only wash what I’ve used that week. I like to start by washing my makeup sponges. 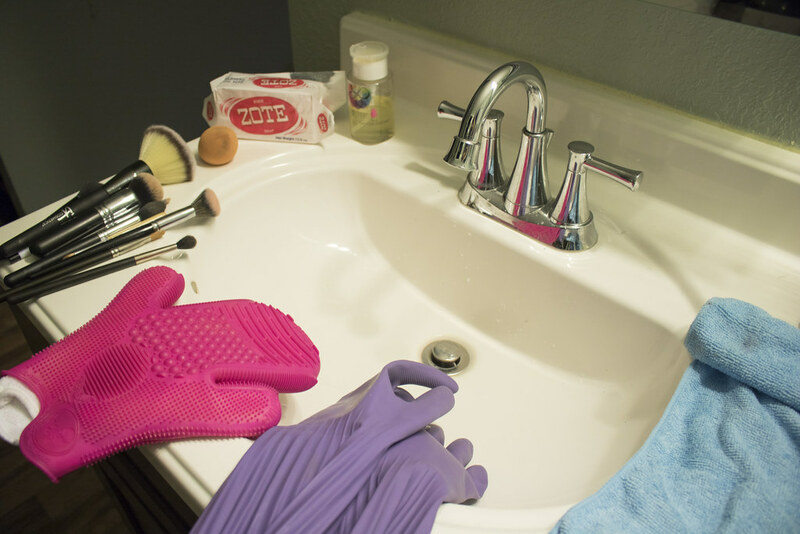 Right now I’m using (and loving) the Real Techniques Makeup Sponge, so I wash that with the beautyblender cleanser. Next I break out the Zoat soap and start cleaning my facial brushes. 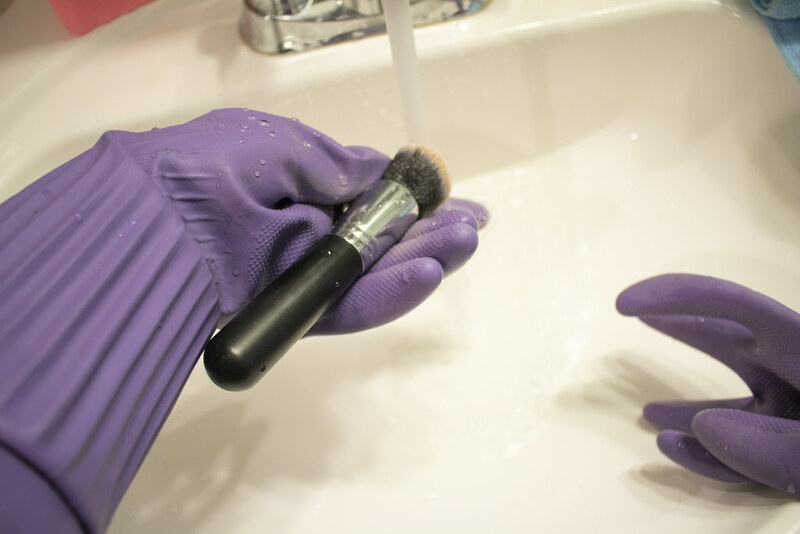 The Sigma glove has two sides – one for face brushes and one for eye brushes. I start with the facial brushes since they tend to be the most dirty. Then I move on to my eye brushes. I set up my brushes to dry on the microfiber cloths. I usually let them air dry all weekend, especially since the weekends are when I take a break from wearing makeup. 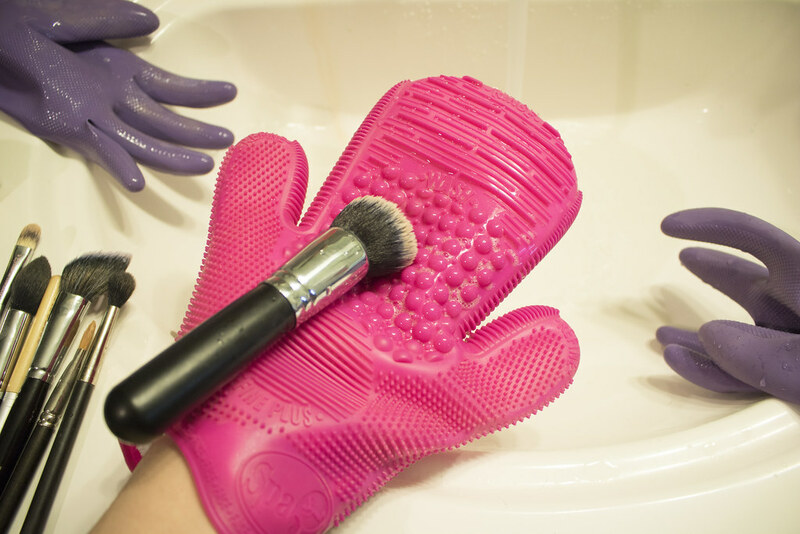 While I love the BeautyBlender cleanser, it is on the pricey side compared to the Zote soap which cleans my brushes just as good. So once that runs out, I’m probably not going to purchase it again when I can get the Zote soap for hella cheap. The Sigma Glove is totally worth it, in my opinion. Not only is it great for doing a deep cleanse, but I use it daily along with MAC’s brush cleanser during the week. I also picked up Morphe Brush Cleaner yesterday to try it out, so we’ll see how that one goes in comparison to the MAC one.